Part of the Salon Series by Ouidad line, the Mongongo Oil is marketed as a multi-use hair treatment offering strands deep nourishment, protection, smoothed out frizz and boosted shine. It has no silicones, sulfates, parabens or waxes... what does that all mean? It's pretty freaking awesome without tons of bad stuff. And like we all know, good stuff doesn't come cheap. The oil is sold in 2 sizes: $36 for 2 oz and $58 for 4 oz. Before you start to have an epic meltdown over the price to size correlation, let me say that NaturallyCurly.com sent me a 2 oz. bottle to try and though it may seem on the small side, a few sprays of this oil goes an extremely long way. I've average about 2-3 sprays for my entire head... meaning I spray 2-3 sprays into my hand, rub together, then distribute. Donzo. That's it. My results typically last a few days... think 3 or 4 on average. So, I won't use more than 6 sprays a week. Looking at the rate I've been using this oil I could easily see it lasting 3-4 months. When you put that into perspective it doesn't make the sticker shock so bad. This super-concentrated, multi-tasking serum is infused with Mongongo Oil, known as “hair food” in Zambia for its high vitamin E content and superb regenerating and antioxidant properties. With American Palm Seed Oil and Broccoli Seed Oil, the formula restructures hair as it deeply repairs damage to restore a healthy appearance to even the dullest locks. By forming a protective film over the hair fibers, hair is instantly more manageable and has a natural, healthy-looking luster. It coats hair to protect against UV rays and environmental aggressors to help defend against damage. Further, it protects hair from aggressive heat styling and helps speed up drying time. I could immediately tell my strands were coated and feeling shinier and smoother. My drying time was noticeably shorter... it shaved off drying time similar to how my Brazilian Blowouts do (cutting it by like 50%), and heat styling with my flat iron took only 1 pass. I honestly didn't want to like this stuff because it's expensive. I'm being 100% honest lol. The last thing I needed was to become hooked on a product that didn't cost $5-$10. I'm not really cheap, but you know... I don't want to drop $36 for an oil. However, after using this oil the past few weeks I've definitely changed my mind. It yields consistent results, and the results are unique enough to not be duplicated with a cheaper product. I honestly haven't found anything that gives me these types of results other than the Brazilian Blowout... which is expensive, but of course is a chemical treatment (though temporary). So, in terms of an at-home DIY hair treatment, Ouidad knocked it out of the park! 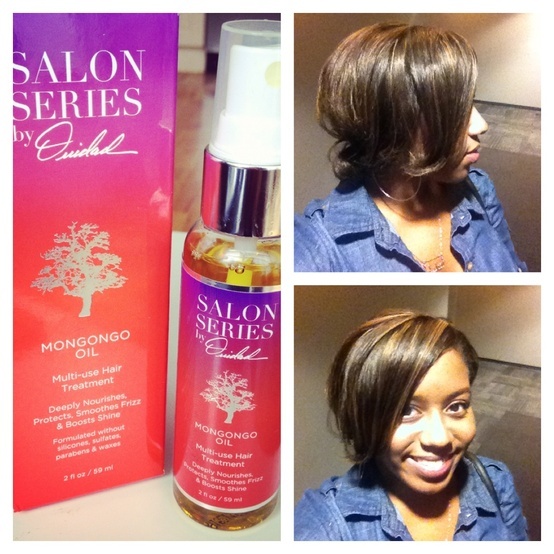 I'm completely smitten with the Mongongo oil. It makes my strands happy and heart smile. If you'd like to learn more about the Mongongo Oil or buy it, click here.